Much of my new book is set in a little town called Deltaville, Virginia. If you've never been to Deltaville, put it on your bucket list. It's a must see. With only one road in and out of Deltaville, few just happen upon the little town unless that are under duress in the water. Legend tells a story of Captain John Smith coming across Deltaville's point in 1608. While exploring its beaches and coastal waters, John Smith was stung by a stingray. He told his crew to dig a grave as he thought he'd die right there on that point. He didn't, of course, but he did leave a name for the point, Stingray Point. Residents of Deltaville still say the little 'town' is a fishing village. People travel from miles around for the seafood caught in the area waters. Folks living there will say they are lucky to be in the most beautiful village around. Though my book takes place in Deltaville, and I've taken many liberties with the village by creating roads and places that are indeed fictional, many from Deltaville will know where my mind was while writing. Nikki is a small town girl who felt she had to get away and live a full life in a city with sidewalks and coffee shops. I chose to use Deltaville, Virginia as Nikki’s small town backdrop because it’s a place where I spent my childhood. My father lived there for more than thirty years. He’s buried in Deltaville. When my father passed away in 2012, I knew I’d never have a reason to go back. Sure, I have family nearby, but I could visit family and never get real close to the actual village of Deltaville. I may never go back. Using Deltaville in 34 Seconds gave me an opportunity to honor a place I love as well as gain closure I needed on a place I may never see again. Stella Samuel is a debut author who reads multiple genres. Her first book, 34 Seconds, talks about the moments where life changes suddenly, and the choices we make in those moments where the people that hold parts of ourselves from the past meet. A literate and lyrical view at love, life and fate, this story is both uplifting and satisfying. Stella is a debut author who loves nothing more than connecting with fans on social media. Her blog bio is: Stella Samuel – Writer, Butterfly and Singer of Silly Songs. Smiles under sunshine but dances in warm rain. Silently wishes to winter in Phoenix. Nikki and Will fell in love a lifetime ago in Deltaville, Virginia. Now living in Colorado with her family, Nikki is invited to attend Will’s wedding back in Virginia where she finds her past staring her in the face. Will never wanted a wife, and he broke Nikki's heart long ago. Nikki knew what she wanted: a strong, happy marriage and children, a future. She found those things when she married Chris, and she and Will managed to grow their friendship after heartbreak. A year after the wedding, Nikki is faced with her painful past again. She soon discovers she must find the strength to help Will on his own personal journey. In thirty-four seconds, she sees him slip from her life forever. Watching Will cross over to his fate, her past collides with her present, and Nikki learns she’s never been in control of her own destiny. Her own journey back to her family in Colorado becomes one of self-discovery. With the help of Will’s voice to carry her across the country, Nikki must decide how she will move forward. You can follow Stella on various social media platforms and her blog. Add "34 Seconds" to your Goodreads to read list! Help Stella make her Thuderclap goal! Join us at Tour Central to find out where we're visiting during the week! Would you like to review this book, or feature the author in a guest post? Sign up here! 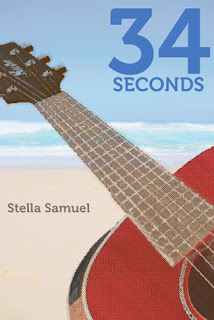 Would you like to win a $25 (or equivalent value) gift card or a signed book from Stella Samuel? Easy entry on Rafflecopter, below!